It took 28 years for the FIH Hockey World Cup to come back to a country which became synonymous with ultimate glory in this sport. The 12th edition of the FIH Hockey World Cup took place in India in 2010. A lot had changed since the time the World Cup was conducted on Indian soil in 1982. There was no more the Indian Hockey Federation, but a young Hockey India, who had taken the reins after the former was dissolved on corruption allegations in 2008. Besides, the venue for the event was the iconic Major Dhyan Chand National Stadium. The famous venue has been a witness to several major events, including the dark days of 1982 Asian Games when India was pummeled 7-1 in front of a huge home crowd by Pakistan in the final. Let us relive the most prominent memories of the 2010 World Cup held at New Delhi. A rejuvenated Team India played their first match of the 2010 Hockey World Cup against a seemingly formidable side of Pakistan. Major Dhyan Chand National Stadium was packed to the brim for this explosive match, that coincidentally fell on the occasion of Holika Dahen. Contrary to the expectations, India took complete advantage of the home crowd, and played to their hearts' content. 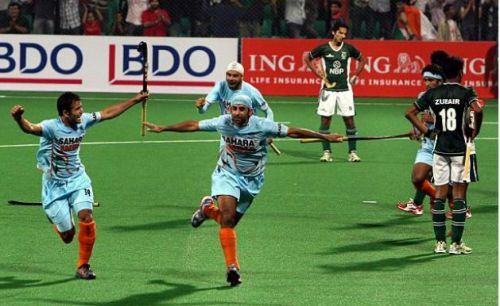 They did not let Pakistan take control of the ball even once, and entertained the crowd with some classic hockey. Star drag flicker Sandeep Singh, who had survived his career threatening bullet injury, was the star of the match, scoring 2 goals from brilliant penalty corners, with Shivendra Singh and Prabhjot Singh, who is also the member of the 2001 FIH Junior World Cup winning team, adding to the joy. The lone Pakistani goal that came was from drag flick champion Sohail Abbas, who scored in the 59th minute. Sadly, India failed to convert this explosive start into a golden finish, and lost three consecutive matches in a row to Australia, Spain and England. Had it not been for Shivendra Singh's last minute gasp, India could've suffered a humiliating defeat to South Africa as well. Despite India ultimately losing to Argentina by 2-4, they achieved their best position since 1994 FIH World Cup, as they finished 8th overall. On the other hand, Pakistan could never recover from their humiliating defeat against India. Barring their lone victory against Spain by 2-1, they were pummeled by every team that faced them. From Australia, who defeated them by 2-1, to England, who thrashed them by 5-2, to even South Africa, who pummeled them by 4-3, Pakistan had the writing on the wall. Nobody could believe that this was the same team who had won 4 FIH World Cups in total, and had finished a respectable 6th in the previous edition. 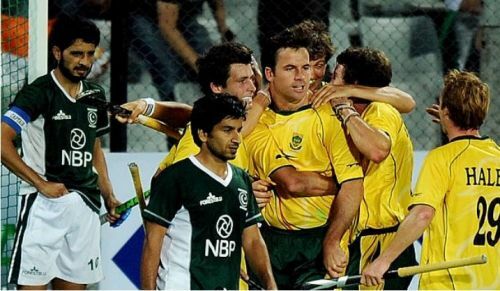 The final nail in the coffin came on 11 March 2010, when Scott Tupper got the golden goal for Canada, relegating Pakistan to the last position. On the other hand, Australia were on a roll. Barring a solitary loss against England, they won the remaining matches to comfortably cruise into the semifinals. Defeating Netherlands by 2-1, they faced their arch rivals Germany once again in the finals. Follow Sportskeeda for all the latest Men's Hockey World Cup schedule, live scores, latest news, previews, points table & stats. On the mission for a hat-trick, Germany was riding high on the success at Beijing Olympics, their second gold as a united nation since Barcelona 1992. They had already defeated Australia in the previous two editions, and looked towards the same at the 2010 edition. However, this Australian team was made from a different stuff. Eddie Ockenden scored a brilliant goal in the 6th minute itself. Even though Moritz Furste fought back, he couldn't prevent the ultimate victory of Australia, which was sealed by Luke Doerner in the 60th minute, as he scored from a penalty corner, giving Australia their 2nd title after a long haul of 24 years.